Click here to see our "Classic Wraps"
Pulled Pork • Coleslaw • BBQ Sauce all in a wrap of your choice. Featured at Lindy's Subs & Salads in Onalaska. Beef Brisket • Tomato • Romaine • BBQ Mayo all in a wrap of your choice. Featured at Lindy's Subs & Salads in Onalaska. 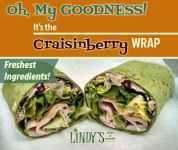 Craisinberry Wrap, Turkey, Cranberry Spread, Walnuts, Craisins, Balsamic Vinaigrette, Romaine Lettuce all in a wrap of your choice. Featured at Lindy's Subs & Salads in Onalaska. Chicken • Parmesan Cheese • Crouton • Egg - Romaine - Caesar Dressing all in a wrap of your choice. Featured at Lindy's Subs & Salads in Onalaska. Turkey • Guacamole • Provolone • Bacon all in a wrap of your choice. Featured at Lindy's Subs & Salads in Onalaska. Ham • Pepperoni • Salami • Provolone • Colby all in a wrap of your choice. Featured at Lindy's Subs & Salads in Onalaska. Tuna • Turkey • American • Provolone all in a wrap of your choice. Featured at Lindy's Subs & Salads in Onalaska. Crab Mix • Provolone all in a wrap of your choice. Featured at Lindy's Subs & Salads in Onalaska. BUILD YOU OWN 4 Layers of meat/cheese of your choice all in a wrap of your choice. Featured at Lindy's Subs & Salads in Onalaska.